Black, white, dark and light bluish gray, clear trans and black trans colors used. 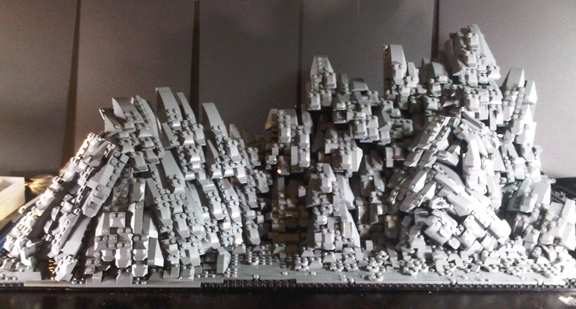 No foreign materials (wood, glue, paint or otherwise) were used – this is pure Lego. No Lego piece have been altered (painted, cut or otherwise). 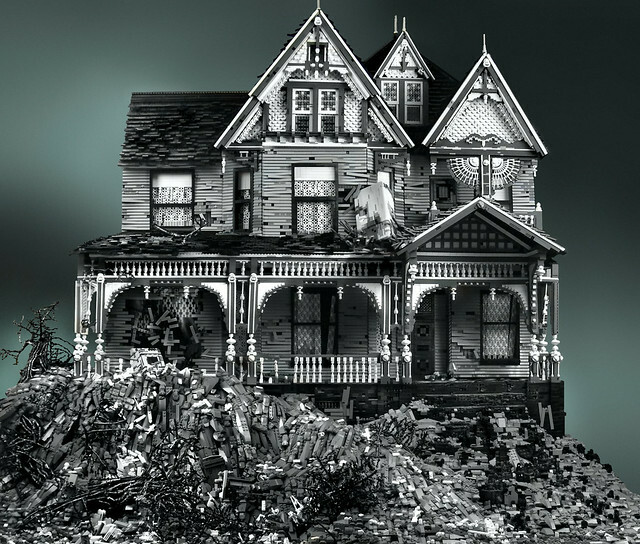 In his series Abandoned Houses, artist Mike Doyle created three spooky abandoned Victorian houses out of LEGO bricks: the TwoStory with Basement, the Three Story Victorian with Tree and his latest, Lego: Victorian on Mud Heap. His blog contains quite a bit of information and photos on how he made each of these fantastic pieces. High-resolution prints of all three houses are available individually at Bumble & Bramble. 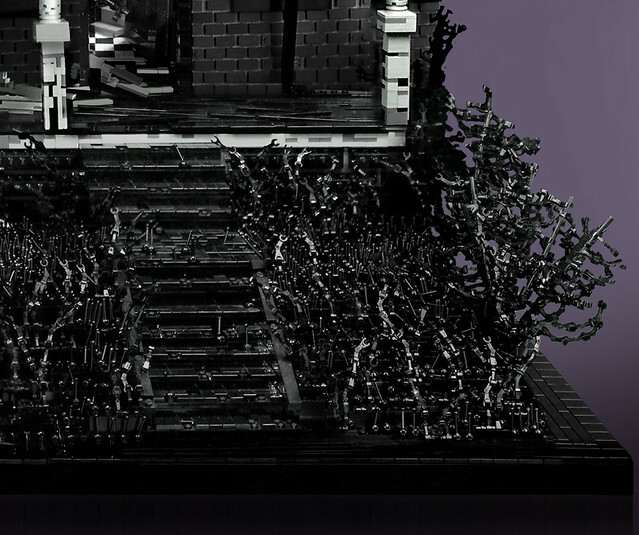 Each print is signed, numbered and comes with a LEGO of the now dismantled pieces. Many ask me how I go about planning and building these pieces. Sadly, I tend to be a ‘messy’ planner, so I do not make any blueprints or basic construction drawings. Rather I just get to work. I start by researching photos I find online. Generally, I find a house feel I would like to recreate. I also look for others that have specific moments of deterioration that I find interesting. 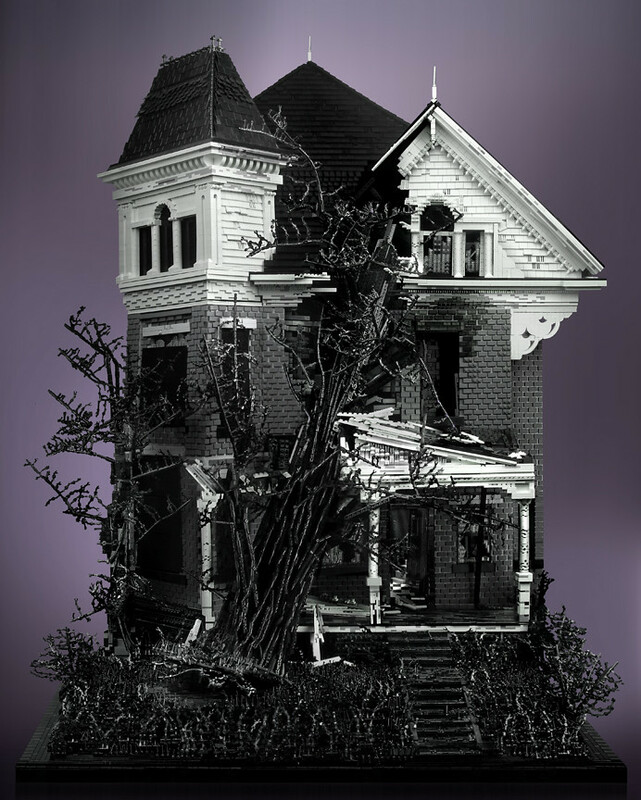 In this case, I also researched houses that have been smashed by fallen trees. Next, I take a look at other moc’s to see if there are any special techniques I can use based on the subject matter. Now for the size. 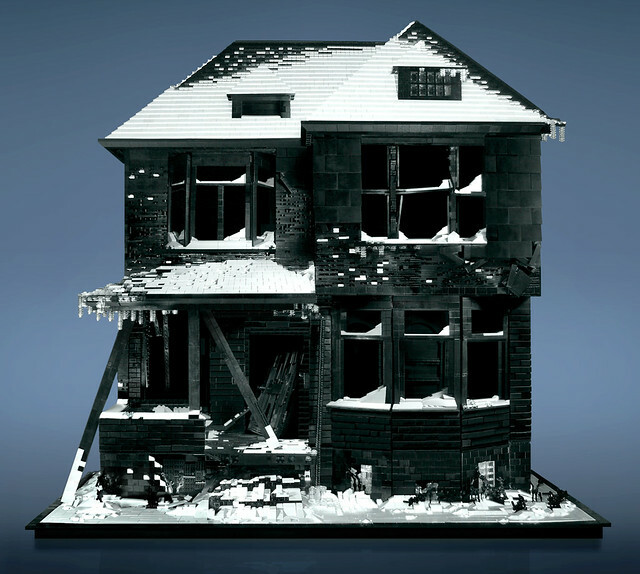 I look on the buildings for objects that I would like to recreate with a piece. In this case, the scale was determined by the size of the bricks. One real life brick is almost the same size as a 1 x 2 tile – the 1 x 2 tile being a little bigger, but not by much. From here, I count out the bricks on the building to determine width and height and use rudimentary measuring tools, like a pencil or thumb held up to gauge relative proportions between the real thing and my work. In this way, I can make sure all is on track. I’ve tried plotting everything out on paper and using measurements, but inevitably I mess up somewhere along the line with the numbers and then have to start over again. Thus, I tend to just ‘wing it’.